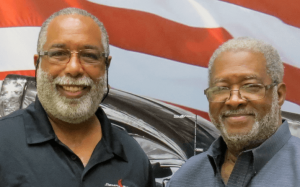 Stevens Transport is honored to announce our Monthly Driver Award Winners for June 2018. Nyoman began his driving career at Roadmaster in Indianapolis, IN before coming to Stevens in 2011. He attributes his success to staying consistently motivated and enjoying the travel aspect that comes with being a driver. The advice Nyoman gives to each of the new drivers he trains is to stay on top of the little things, do the best you can, and ask plenty of questions. Thank you for all you do and congratulations on this achievement, Nyoman! Johnny attended University of Houston for his CDL training and was hired by Stevens in December of 1999! He decided to become a truck driver as he was looking for a new challenge, which has turned into a career of almost 20 years. He attributes his success to keeping safety at the forefront of all he does. Johnny advises the new drivers he trains to make sure driving is a career they are passionate about. Thank you for preparing the next generation of drivers and congratulations, Johnny! Randall began his driving career in Colorado and was hired by Stevens in February of 1996. He explained that he enjoyed the training program, especially his trainer, who he learned a tremendous amount from. Randall attributes the success he’s had to having a solid foundation from training, to the support at Stevens, which allows him to do his job in the best way possible. The retired military veteran enjoys golfing and spending time with family when he is not out on the road. Congratulations, Randall! Richard attended the Stevens Driving Academy for his CDL training and was hired by Stevens in 2005. He attributes his success to trying to stay one step ahead and having a passion for driving. He advises new drivers to be sure that driving is the right fit for them. When he’s not on the road, Richard likes to golf and ride his motorcycle. Congratulations, Richard! Brian received his CDL training at Stevens Driving Academy and was hired in 2011. He attributes his success to time management, which he says is the most important aspect of being a Stevens Contractor. Brian says that the aspect of Stevens that he enjoys the most is the quality of the equipment and how each truck is maintained in the best shape possible. When he’s home, Brian enjoys cooking, spending time with family and relaxing. Congratulations, Brian! Sean completed his CDL training at Tampa Truck Driving School and was hired by Stevens Transport in November of 2017. He decided to become a driver after deciding to leave office jobs and he wanted to see the country. Sean attributes his success to proper planning, which he says by doing so sets a benchmark for him to attain a goal, no matter how small. His favorite thing about Stevens is the relationship he has with his Driver Manager and the family atmosphere of the company. Congratulations, Sean! Curtis attended Stevens Driving Academy for his CDL training and was hired by Stevens in 2011. His father and uncle were both truck drivers, which made the decision to become one himself relatively simple. His advice for new drivers is to pay attention while in school an listen to their trainers. The most memorable moment for Curtis was when he received his CDL and was able to start his career as a truck driver! Congratulations, Curtis! Diana attended Georgia Driving Academy, while Alicia received her CDL training at National Tractor Trailer School and both were both hired in 2017. They attribute their success to teamwork, which is solidified in their strong friendship. This motivates each person to not let the other down. Both wanted a new challenge when they decided to become drivers and decided to form a team once they met at Stevens. Congratulations, Diana and Alicia! James attended the Tennessee Truck Driving School where he received his CDL training and was hired by Stevens in April of this year. In his time with Stevens, James has seen some great success! He attributes this to his trainers, who he said did an excellent job of teaching him all he needed to know about driving. 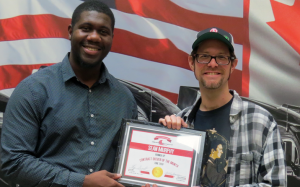 James advises new drivers that if they love traveling and having freedom in their job, truck driving will be the perfect career choice. Congratulations, James! Rebecca was hired by Stevens in March of this year. 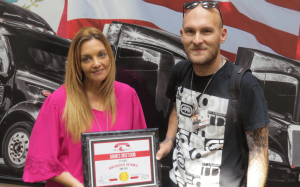 She attributes the success that he has seen in his time with Stevens to her driver manager, who she says is her biggest supporter and constantly gives her updates and information to keep her safe and help make her job as easy as possible. She advises new drivers to not be afraid to ask for help or to face new challenges. 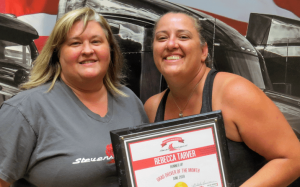 Congratulations, Rebecca!